Pega uses a concept called Storage Stream (aka. Pega 7 BLOB) to store property data in a column in a pegaDATA database in compressed format. This column is named pzpvstream. The data type of this column is BLOB (binary large object) for most DB vendor software (e.g. Oracle, Microsoft SQL Server, PostgreSQL)). 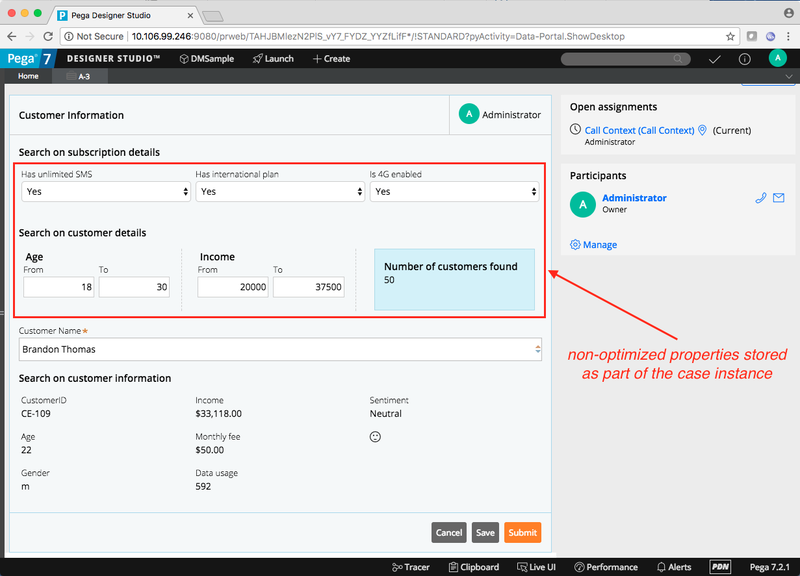 The Pega 7 BLOB column is used to store user-defined custom properties (and many other things). This allows the pegaDATA database to remain flexible when developers create custom properties and removes the need to change the DB schema. Using pegaDATA DB provided functions for reading single property values from a BLOB. Creating a Java/JDBC program to read the entire BLOB and decompress its contents. A sample application is included in the Pega 7.2.1 SSA Exercise System distribution. It is called DMSample. Login to the Designer Studio with administrator@pega.com and install and open the application. 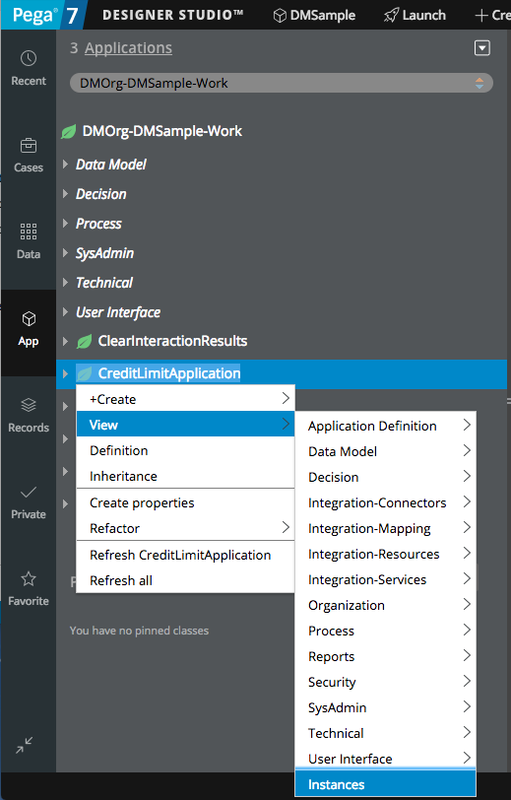 Navigate to the Application Explorer and open the CreditLimitApplication case. 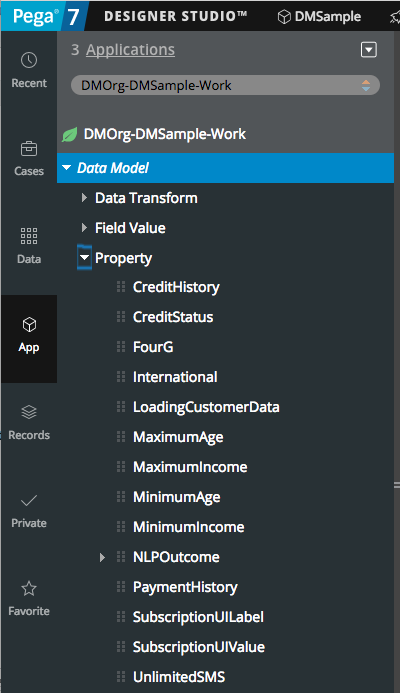 Run the case to create some case data in the pegaDATA database. For example, the case is run below and submitted for a customer named Brandon Thomas. 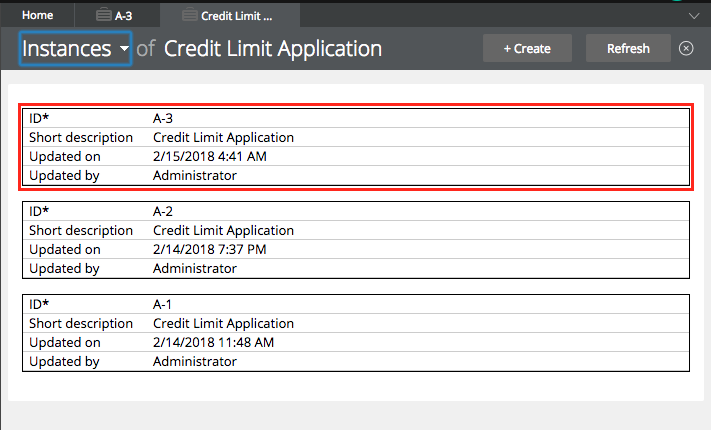 To view all instances of the CreditLimitApplication case type, right-click on it in the Application Explorer and select View > Instances. Here, the case type instance with the ID A-3 was just inserted. The CreditLimitApplication case type belongs to a work class called DMOrg-DMSample-Work. Several properties are defined on this class. These properties are not optimized and thus stored inside the storage stream (BLOB) in the Pega 7 database. 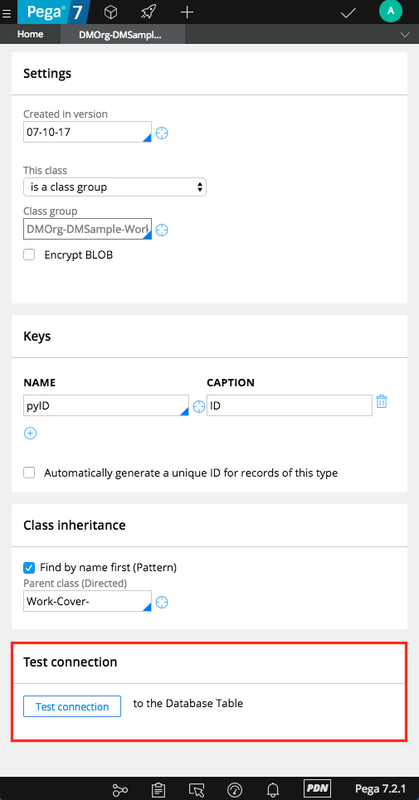 To find out to what database table the DMOrg-DMSample-Work class is mapped to, open the class definition and click on the Test Connection button. 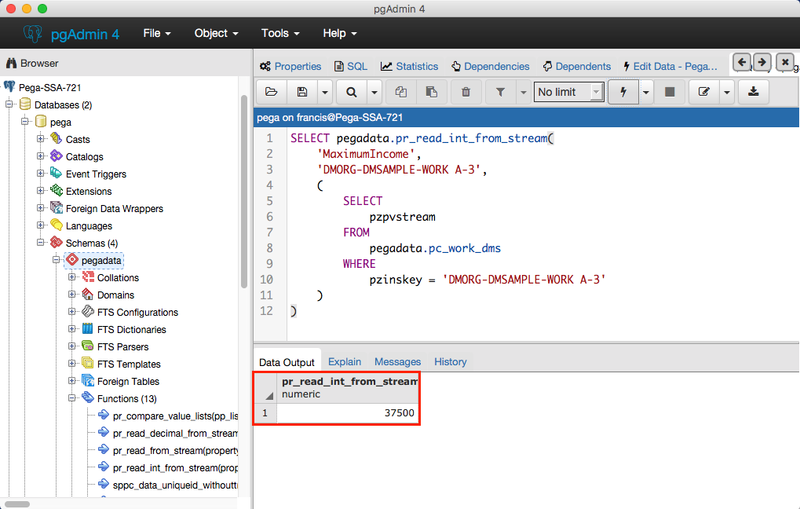 The Pega 7 database can be queried to retrieve the case type instances from that table using pgAdmin to execute SQL queries such as the example below. The below screen shot shows the results of running the query in the pgAdmin tool. The last column, named pzpvstream, is the compressed Pega 7 BLOB. It contains the non-optimized custom properties’ values such as MinimumIncome and MaximumIncome that were entered on the Customer Information screen when the case was created. For general information on how PostgreSQL stores binary data in a byte array, see datatype-binary. For example: To read the MaximumIncome property form the case type instance were the pzinskey equals DMORG-DMSAMPLE-WORK A-3, a query with a sub-query as shown below needs to be executed. See lines 5 to 12, for how the Pega 7 BLOB is obtained in the sub-query and then passed into the function as the third parameter. This query returns the numeric MaximumIncome value for the given case type instance, which is 37,500. The SQL CREATE syntax of the function pr_read_from_stream can be viewed in pgAdmin and is shown below. In the function body, in lines 14 to 17, a static method of a Java class is called. The function input parameters are passed to that Java method, which inflates and decodes the Pega 7 BLOB. 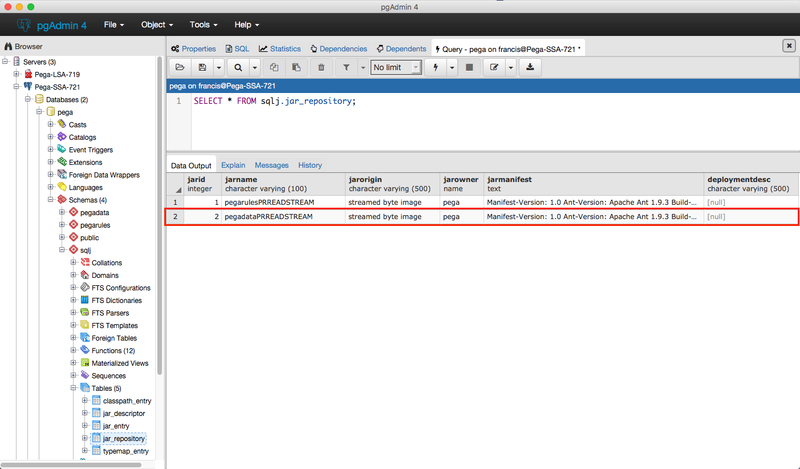 The class DirectStreamReaderPostgreSQL in the function body was created when a JAR file called prreadstream.jar was installed in the sqlj schema in the Pega DB as part of the Pega 7 installation. See PL/Java for more information on Java language support in PostgreSQL DB functions. The below query lists the installed JAR files. There are 2 and they are actually identical. There are 20 classes in the pegadataPRREDSTREAM in the JAR that was imported into the jar_entry table. These classes can be extracted so that an external Java program can use them to access the Pega 7 BLOB. 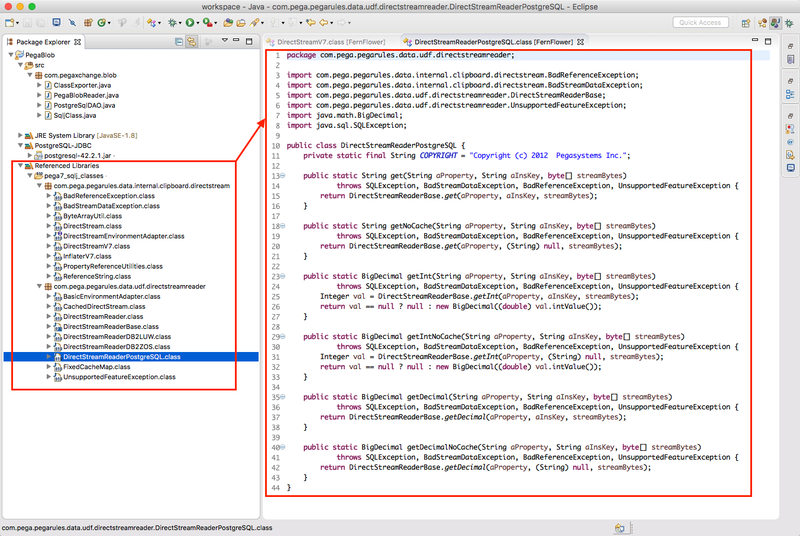 Here is a screen shot of my Java project in Eclipse Neon. Note the PostgreSQL JDBC driver JAR in the PostgreSQL-JDBC user library. The source code of the 4 Java classes used to extract the Pega 7 PL/Java classes for BLOB access is shown below. The below Java class named PostgreSqlDAO is used to access the Pega 7 PostgresSql database. The method getSqljClasses reads the Pega 7 PL/Java classes from the sqlj.jar_entry table. The method getBlob is used to read a specified Pega 7 BLOB from the database. The PostgreSql DAO class relies on a Java bean class named SqljClass for storing the jar_entry records obtained from the Pega 7 sqlj database. The source code is shown below. The Java byte code of the entryimage column is stored in the entryImage field of type byte array. It uses the PostgreSQL DAO class to load the JAR entries from the sqlj.jar_entry table. It writes the Java byte code from the entryimage columm to Java class files, using the entryname column values as the file names. // 1. 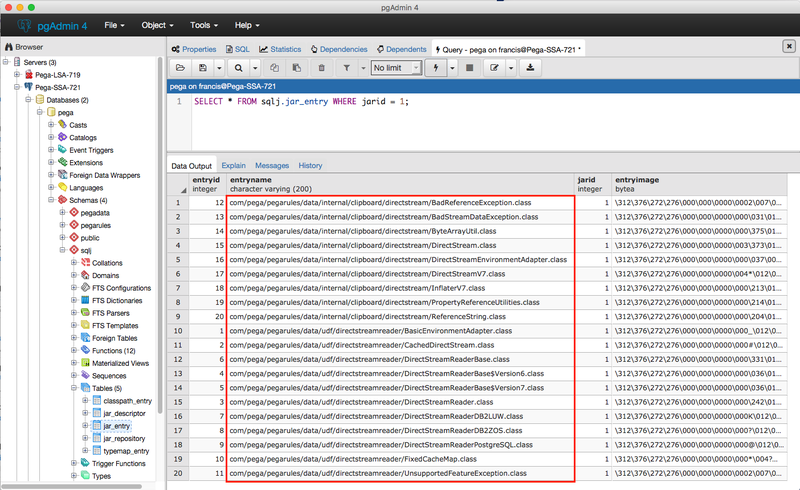 Load JAR entries from the Pega 7 database (sqlj.jar_entry). // 2. Create class files based on class name and Java byte code. Run the ClassExporter to extract all of the Pega 7 PL/Java classes that contain the logic to access the Pega 7 storage stream BLOB. The program will create the directories and Java class files in the specified location (see line 26) as shown below. These classes can now be used in a Java program. I used Eclipse Neon to add these classes as an external source to my Java project. Right-click on the project and select Build Path > Configure Build Path. Then use the button Add External Class Folder and point to the folder to which the PL/Java classes were exported. The classes are now available in the Eclipse Java project under the References Library node. I also installed the Eclipse plug-in Enhanced Class Decompiler, which automatically decompiles Java class files into source code. The above image shows the source code of DirectStreamReaderPostgreSQL.class. The exported Pega 7 PL/Java classes can now be used to perform a variety of BLOB operations. The below Java program simply prints the contents of the storage stream of the DMORG-DMSAMPLE-WORK A-3 instance from the pc_work_dms table that was shown earlier. See lines 28 through 30 for using InflaterV7 and DirectStreamV7. The method DirectStreamV7.toString() creates the below String representation of the given Pega 7 BLOB. The non-optimized properties are highlighted in green. Such a clear explanation of what goes inside Pega. We tried the same to extract the class files and use it to build a standalone app to extract blob info. But we are facing few issues with this approach. 1. 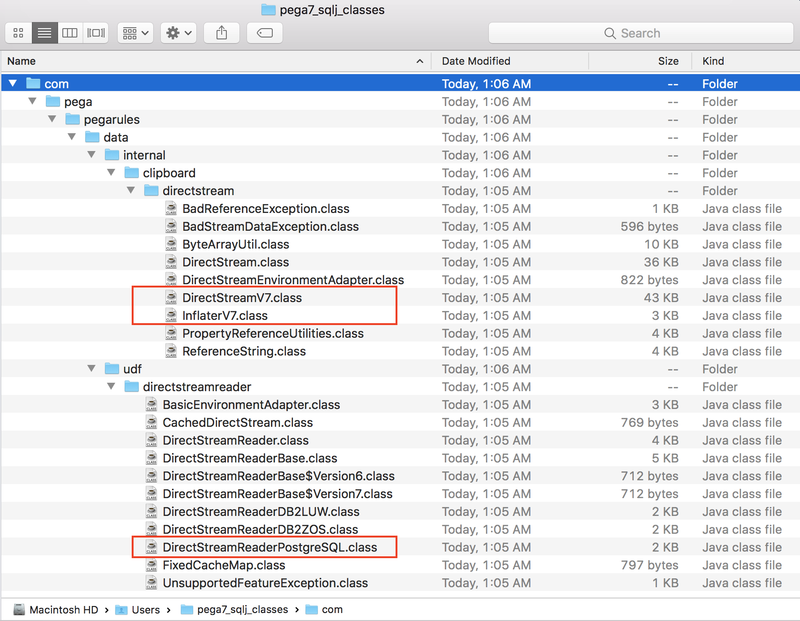 We are unable to see the source code of those class files using enhanced class decompiler. May be the code is obfuscated. Any way we can get rid of this issue? thanks for the comment. For 1, can you provide more details? What kind of Pega distribution are you using? In my post, I used the exercise system.